October 25th is the big day. It’s the day that thousands of gamers from around the world will log in to their video streaming apps and turn on their consoles to fight evil. Sure, they’ll fight the bad guys in their games, but they’ll also be fighting a bad guy bigger than any single game could possibly bring to the table. 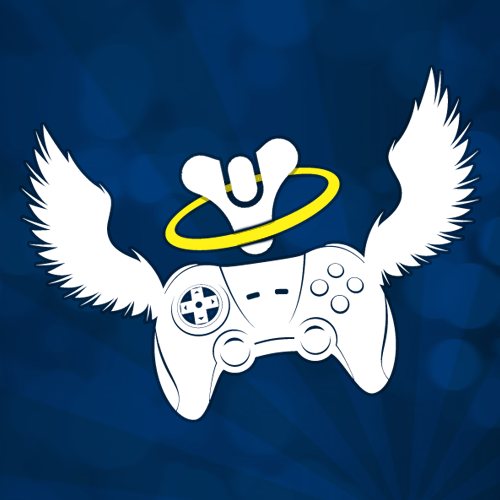 The 25-hour long video game playing marathon known as Extra Life raises money for hospitals that are a part of the Children’s Miracle Network (CMN) in North America, helping kids and their families deal with deadly diseases and pay for their medical bills. Gamers can sign up as individuals or as teams, and they choose which CMN hospital their proceeds will go to. One team that has garnered a lot of attention this year is the Destiny community. Made up of players of the new game by Bungie – the creators of the wildly popular Halo franchise – and headed by the staff of two of Destiny’s top community websites: Guardian Radio and Destiny Dispatch, the Destiny community team is hoping to make a big impact when they send their donations to the Seattle Children’s Hospital. The hospital also happens to be one that Bungie supports, so this is the fans’ way of giving back not just to the children, but also to the company that created the game which brought them all together. “If you make a drop in a bucket somewhere, if everyone does that, it’s going to make a difference everywhere. So you should really work towards bettering one hospital, and if everyone does that it’s good for everyone” said Destiny Dispatch Lead Writer David Weeks during an interview on October 5th. It all started last August. Destiny Dispatch had fostered a sense of community among Destiny players since the game was announced in late 2012/early 2013. They quickly became friends with the founders of Guardian Radio, a site that produces weekly podcasts featuring news about the game. Guardian Radio approached Destiny Dispatch about getting involved in Extra Life, and the rest became history. The two groups did a live stream last year via the Twitch TV app, switching off with a gamer named Datto who runs a successful YouTube channel that specifically focuses on Destiny and has over 100,000 subscribers. Most teams involved in the Extra Life campaign will be playing a variety of games during the marathon, but the Destiny community team aims to play as much of their favorite game as possible. Byf, one of Guardian Radio’s podcasters and a Destiny-focused YouTuber in his own right, flew from his home in the UK to Seattle, Washington this summer to visit the children’s hospital and to meet with Bungie’s Community Manager, Deej. When he mentioned the Destiny community’s intention of making a team for Extra Life again this year, Deej was happy to donate some prizes for the team to give away during their livestream, and to feature them in a Community Focus article on the Bungie website and Destiny app. According to a recent Guardian Radio podcast, these prizes include everything from Bungie water bottles and swag bags to limited editions of the Destiny game. The prizes will be given away randomly along with numerous others from the individual live-streamers throughout the event, which will run from 8a.m. EST Saturday the through 8a.m. EST on Sunday. “What we’re really good at is bringing everyone together” said Weeks. “I guess [it goes] back to one of the founding principles of the game itself: it’s all about you and your friends pulling together to tackle this big evil. 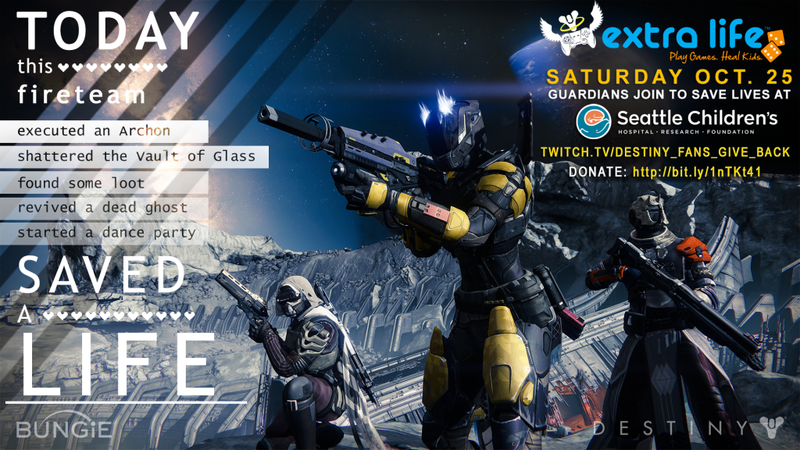 We found Extra Life and we thought it would be a good idea to [band together for] a charity.” The Destiny community is just one of many teams that will go toe-to-toe with evil on Saturday. Anyone looking for more information on the Extra Life campaign and how to donate to the Children’s Miracle Network hospital of their choice can head online to the charity event’s website at www.extra-life.org.